La Rosière is located in the Savoie region along with the likes of Val d’Isère, Tignes, Les Arcs and La Plagne. Although one of the less internationally-known resorts compared to its neighbours, La Rosière is one of the most family-friendly resorts in the Alps! With plenty of wide and gentle slopes, it’s the perfect terrain for beginners to learn and improve their skills on the snow. 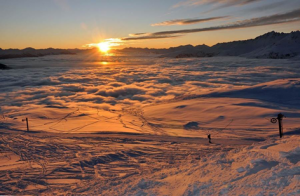 La Rosière links with the Italian resort of La Thuille and is one of the few resorts to offer cross-border skiing in both France and Italy. La Thuille generally has more intermediate terrain than La Rosière so advanced skiers would have to venture across the border to find the more challenging slopes. However, this winter season La Rosière has undergone a major expansion of its ski area to create more advanced pistes within the resort - the Mont-Valaisan area. What is the Mont-Valaisan area? Mont-Valaisan is the name given to the €15 million project to expand the ski area in La Rosière. There’ll be two brand new speedy chairlifts and a network of red runs as well as easy access to plenty of off-piste terrain, creating a playground for intermediate and advanced skiers. The new Mont-Valaisan area will be serviced by two consecutive 6-seater chairlifts. The first is the Moulins express which will run between 1,935m to 2,450m and take approximately 5 minutes. From the top of this lift, there will be 5 red pistes for skiers to tackle. The second is the Mont Valaisan Express which goes up to 2,800m and takes 3 minutes. This new lift will increase the resorts peak height to 2,800m. The new 6km of runs will be located to the right of the lifts, with the more challenging runs from the top of the second lift. To the left of the lifts will be mainly off-piste. quiet slopes, strong snowfall and stunning scenery. How will this change the resort? The new lifts and pistes will give the resort a new peak height and create more advanced skiing for intermediates and experts. However, La Rosière will still remain a relatively quiet resort. This is mainly due to the low amount of tourist beds in relation to the ski area – another reason it’s so good for families! This year there will be approximately 14,000 tourist beds in La Rosière and La Thuille for 160km of pistes. This total count includes the new Hyatt-Centric Hotel, Hameau de Barthelemy and Chalet Grivola apartments which were built for the 2017/18 season, and the Balcons de la Rosière hotel which is being built for the 2018/19 season. As a comparison, Tignes and Val d’Isère have a combined 56,000 beds for 300km of piste! Can we expect any other changes in La Rosière this season? In addition to these new pistes, La Rosière will have a brand new panoramic glass-bottomed walkway located at the top of the Fort Express walkway at 2,383m on the way to Italy, as well as the Petit Saint Bernard 1km Funcross. The development will see 20 new staff employed and the resort will host an opening event for it in the first week of the season –on the 16th December, 2018. We can’t wait to try out the new slopes this season! If you would like more information on La Rosière or to book your next trip please give us a call on 020 3080 0202 or reach us via our online chat facility.